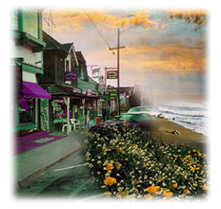 A short walk from the water�s edge, the Sea Otter Inn is a cozy haven for travelers exploring the Central Coast. All rooms offer a fireplace and a warm country style, and many offer whirlpool tubs and ocean views. A heated pool and spa are available for your enjoyment, and a Continental breakfast is offered each morning. Cambria, on Moonstone Beach, ocean-view rooms, continental breakfast, heated pool and jacuzzi, picnic area, beach access, near Hearst Castle.